I love reading and recommending books! I also love discussing books on various topics – from politics and social issues, to poetry and which Game of Thrones character is the best (which is Tyrion Lannister). I also love getting my students to read more books, as that can help improve their vocabulary, grammar, and spelling. Plus, they might find a topic they enjoy learning about as well. 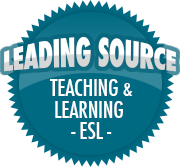 I came across an amazing, and helpful, ESL blog called A World of Language Learners. One of their most recent posts is about diverse books for ELLs! I’d love for you to check out the post (and hopefully those books, too).